Petite ceramic dish in rare design. By Piero Fornasetti and signed to reverse. 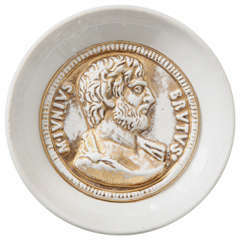 Shallow bowl made to resemble an ancient Roman coin engraved with the head of M. Junius Brutus. Vintage Fornasetti dish depicting ornate skeleton keys on faux malachite background. Large ceramic dish made to look like an antique bill of sale from Weikel & Smith Spice Co. of Philadelphia. Designed by Piero Fornasetti and signed to reverse. Vintage Fornasetti dishes with musical instrument theme. 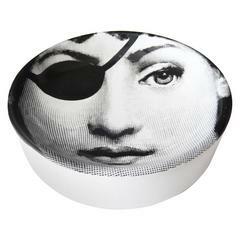 By Piero Fornasetti and signed to reverse. Price is for both. A ceramic dish by Piero Fornasettii of his enigmatic muse Lina Cavalieri. Strong graphic design in excellent condition. Marked. A perfect gift for a buccaneer friend. 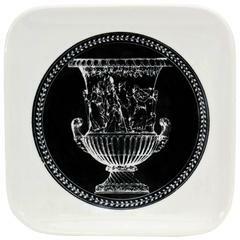 Fornasetti decorative dish. White and black ceramic dish. A beautiful Fornasetti dish, in the manner of a newspaper. This unique dish would be a great addition to your collection, or a stand alone conversation piece for any side table.